ZirMed is a comprehensive End-to-End Platform for Revenue Cycle Management (RCM) and Population Health Management (PHM), designed to help and empower healthcare organizations of all types and sizes to maximize their revenue while improving the quality of population health. With ZirMed, your organization is given a platform loaded with features and capabilities to help you manage the attain and maintain peak revenue cycle performance and at the same time deliver quality healthcare to your patients. ZirMed is built to help you get paid in full by patients and payers in the fastest and most cost-effective way. The software utilizes predictive analytics technology to scour your data and discover actionable insights and new revenue opportunities buried beneath the figures and charts. It streamlines and automates your workflows and updates automatically so you can focus on getting things done. Healthcare organizations and institutions need to generate revenue to keep their operations running, pay for the upkeep and upgrade of their facilities and services, and more so that they are able to deliver high quality care for their patients. 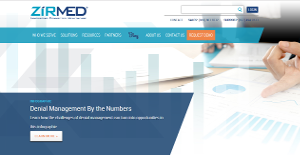 With ZirMed’s cloud-based financial and clinical performance management solutions, healthcare businesses and organizations such as hospitals, health systems, and individual healthcare practices are able to leverage modern technology to help them rake in significant revenue while being able to provide the best health services to their patients. ZirMed is an ideal platform for hospitals and health systems like accountable care organizations (ACOs), independent physician associations (IPAs), and billing services. Ambulatory surgery centers (ASCs), laboratories, durable medical equipment suppliers (DMEs), and home health providers will also benefit from ZirMed’s slew of solutions. The software delivers a plethora of solutions that cater to various and shifting needs of every type of healthcare organization. The software lets your healthcare organization easily adapt and scale your business to keep up with shifting changes in industry practices as well as common and unique problems such as changing models for reimbursements, increasing patient financial responsibility, poor income, and rising costs. ZirMed gives you advanced solutions so you can steer your bottom-line performance and face and address today’s and tomorrow’s challenges effectively and efficiently. What Problems Will ZirMed Solve? 1. With self-pay on the rise, it is more important than ever to have a comprehensive collection plan. ZirMed offers many solutions to achieve this goal: eligibility verification to identify insurance coverage, patient estimation to allow patients to understand and prepare for estimated costs up front, coverage detection to identify hidden coverage, and patient collection tools including but not limited to e-statements in addition to paper statements, patient payment plans, and the ability to pay via any device. 2. The way organizations manage and work denials is often complicated, time-consuming, and ineffective. And it doesn’t give you enough understanding of why your denials happen, trends related to specific payers and types of denials, and how it all impacts your organization—making it difficult to be proactive in reducing your overall denials. ZirMed can solve all of those problems! 3. Charge capture leakage often happens through process inefficiencies and/or lack of coding compliance. ZirMed can ensure the integrity of all inpatient and outpatient accounts—and do it all in one easy-to-use cloud-based solution, with no new hardware, locally installed software, IT support, or maintenance needed. ZirMed Charge Integrity leverages applied mathematics and evidence-based rules to dig deeper than ICD and HCPCS codes and uncover pockets of new revenue hidden in your own data. If you are interested in ZirMed it might also be a good idea to analyze other subcategories of Best Business Process Management Software listed in our database of SaaS software reviews. Each organization has different requirements and requires an application that can be personalized for their size, type of staff members and customers, and the specific industry they are in. For these reasons, no system can provide perfect features out-of-the-box. When you look for a software system, first be sure what you require it for. Read some ZirMed reviews and ask yourself do you desire basic features or do you want sophisticated tools? Are there any industry-specific tools that you are seeking? Get the answers to these questions to help your search. There are lots of elements that you need to consider and these include your budget, specific business requirements, your organization size, integration needs etc. Take your time, use a few free trials, and finally zero in on the platform that provides all that you require to improve your company competence and productivity. How Much Does ZirMed Cost? Contact ZirMed for enterprise pricing information and other details. You can also submit a request for a demo to see if the software is a perfect fit for your business. We realize that when you make a decision to buy Business Process Management Software it’s important not only to see how experts evaluate it in their reviews, but also to find out if the real people and companies that buy it are actually satisfied with the product. That’s why we’ve created our behavior-based Customer Satisfaction Algorithm™ that gathers customer reviews, comments and ZirMed reviews across a wide range of social media sites. The data is then presented in an easy to digest form showing how many people had positive and negative experience with ZirMed. With that information at hand you should be equipped to make an informed buying decision that you won’t regret. What are ZirMed pricing details? What integrations are available for ZirMed? ZirMed has an API which allows most organizations to integrate with us. It also has native integrations with several practice management systems and health information systems. If you need more information about ZirMed or you simply have a question let us know what you need and we’ll forward your request directly to the vendor.